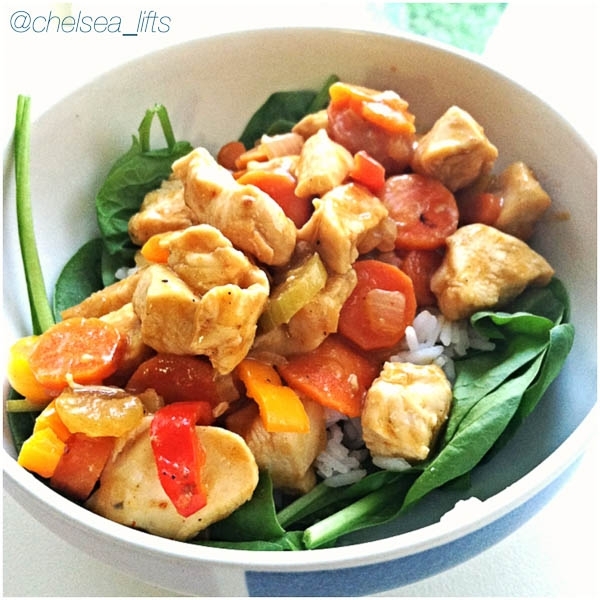 Red Chicken Curry mixed with Carrots, Celery, Onion, and Sweet Peppers served on top a bed of Wilted Greens and Jasmine Rice. Cut/Dice carrots, celery, peppers, onion. Prep/clean chicken and cut into about 3/4-1" cubes. In a wok, on medium-high heat, sautÃ© onions and 1tbsp minced garlic. Once sautÃ©ed add in the carrots and celery and let cook. While the vegetables are cooking, begin cooking rice in medium pot according to the package instructions (to help keep rice from sticking add in a couple of dashes of salt and stir every 3-5 minutes). Stir the vegetables every 2-3 minutes. Once the vegetables have softened some (after about 10 minutes) add in chicken. Again, stir every 2 minutes so all chicken gets cooked thoroughly. After 5 minutes, add in curry sauce. Lower heat to medium and cover chicken and let steam for 5 minutes. Stir and check to see if chicken is cooked. If cooked, turn down stovetop to simmer, stir in cornstarch, and then throw peppers on top, cover, and let simmer for about 3-5 minutes. To assemble: place spinach in bottom of bowl, spread rice on top of spinach, then spoon chicken/vegetable curry on top of rice.